A scene from the Mortuary Chapel of Menna. In the top row from left to right, a boy walks along driving an animal, and carrying a small kid. Menna waits under a canopy to watch the arrival of a boat from some other part of his estates. A servant receives the passengers as they come ashore, and sailors are beaten for being late of arrival. 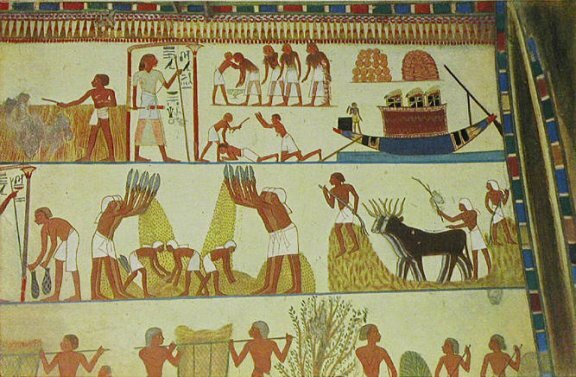 In the second row, scenes of winnowing and threshing are illustrated.